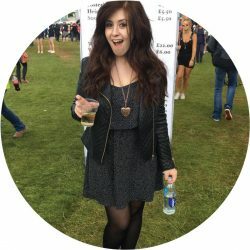 I think every girl I know is guilty of a fashion ‘obsession’; shoes, scarves, rings…I even have one friend who collects various styles and shades of tights(! ), and keeps them all lined up in a special drawer. Personally, though, my biggest love has to be handbags. Barely a month goes by where I haven’t splurged on some new style or other that I just have to have. 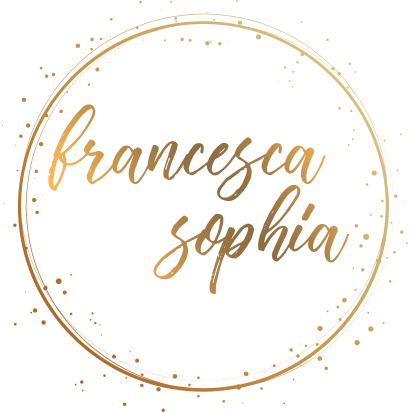 Because of this, I guess always came as a bit of a surprise to my friends when I reached into whatever gorgeous new piece of arm candy I was carrying that week, and plucked out the same, old, tattered River Island purse I’d been dragging around since I was 15. Luckily, though, I just had a pretty big birthday, and decided this was the best time to get a stylish upgrade to a slightly swankier wallet. After what felt like months of indecision (Miu Miu? Marc Jacobs? Mulberry? 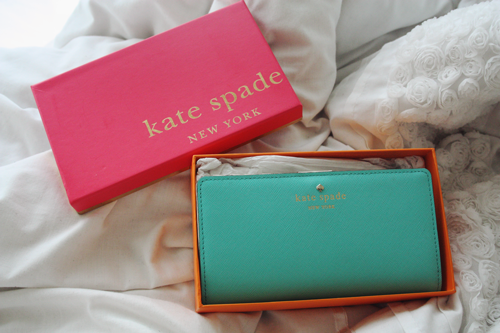 ), I eventually settled on one of my favourite designers’ offerings – Kate Spade’s ‘Mika’s Pond’ Stacy wallet, in ‘Fresh Air’ (or, as I prefer to refer to it, ‘Tiffany-box-blue’). 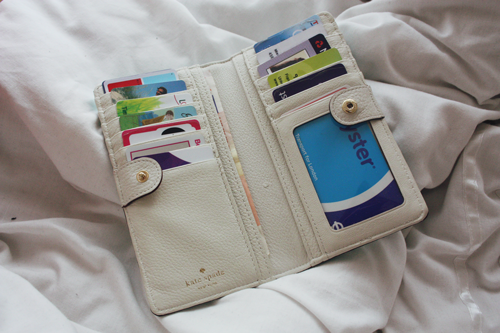 Like most students I know, I rarely carry cash around with me, and rely instead on debit cards, student cards, and loyalty cards to get me through my serious shopping addiction, so the 12 card slots that the Stacy wallet offers is pretty much ideal – and, being a part time Londoner, the ID compartment is perfect for Oyster card storage, so I don’t have to fumble around in my bag when I’m about to hop on the bus or tube. It’s probably too soon to call it, but honestly, I think it might be love. 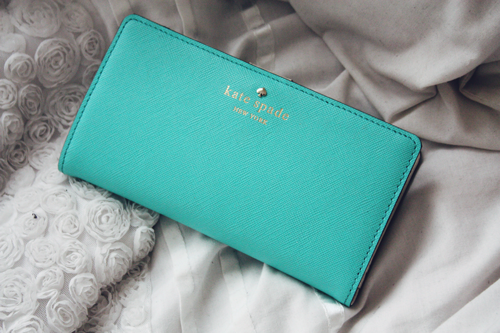 The ‘Mikas Pond’ Stacy wallet is available in the UK, for an RRP of £80, from Kate Spade stores. What’s your most overlooked accessory?